Two of Cornwall's biggest and busiest beaches are being patrolled by Police Community Support Officers (PCSOs) who are fully trained as beach lifeguards. 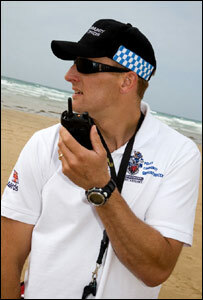 Two officers will patrol Fistral and Perranporth throughout the summer. They will be responsible for community safety including issuing alerts over missing children, lost property, theft and general reporting of crime. 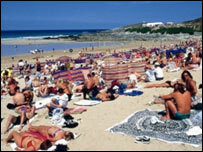 The scheme is a joint initiative by Devon and Cornwall Police and the RNLI aimed at improving beach safety. The PCSOs have been given full training as lifeguards by the RNLI and can be called on to assist the beach lifeguards during an emergency. Peter Dawes, the RNLI's national lifeguard manager, said the beach PCSOs will be of enormous benefit to the RNLI lifeguards. "A beach PCSO provides an extra resource on the beach to carry out duties that in the past have had to be dealt with by lifeguards," he said. "This will allow the RNLI lifeguards to concentrate fully on their core responsibilities of providing vital beach safety information, responding to both major and minor incidents and ultimately saving lives at sea." Supt Barry Frost from Devon and Cornwall Police said the trial would provide the best possible service to local people and holidaymakers. "By combining roles, both organisations gain resources and the public get a far more efficient and dynamic service," he said. "In my mind this is a fantastic opportunity at partnership working between a statutory body and a charity. "We have been very impressed with the lifeguard training provided to our PCSO's which will ensure beach safety in and out of the water and in it's widest possible sense." The project will be evaluated at the end of the summer season before a decision is made about continuing the scheme in 2008. The RNLI said more than 10,000 people were helped by beach lifeguards in 2006 and this summer 66 beaches across Cornwall, Devon and Dorset are being patrolled.